Dinosaurs were a group of animals that first appeared during the Triassic period of the Mesozoic Era, perhaps around 230 million years ago. They evolved from early Archosaurs (see dinosaur family tree) and went on to become the most successful land animals for the next 165 million years ago. At some point during this era (probably during the Jurassic period), the first birds evolved from dinosaurs. Then, suddenly, about 65 million years ago, all the dinosaurs (except birds which are technically a group of living dinosaurs), became extinct. During the time that dinosaurs ruled the land, there also lived a number of other large reptiles, including Pterosaurs (flying reptiles), and a wide variety of marine reptiles including Nothosaurs, Thalattosaurs, Placodonts, Plesiosaurs, Pliosaurs, Mosasaurs, and Ichthyosaurs. None of these other reptiles were dinosaurs. So what exactly is the definition of a dinosaur? The original definition of the taxon Dinosauria was made by the British paleontologist, Sir Richard Owen, in 1842. Owen used the name "Dinosauria" (which means "terrible lizards") to refer to a specific group of extinct reptiles, of which a number of examples had then be found. Today, building on Owen's work, dinosaurs are defined based on a number of common skeletal features. The most important of these being an erect posture (similar to that of modern mammals), which allowed dinosaurs to breathe more easily while moving, and probably assisted dinosaurs in living an active lifestyle. 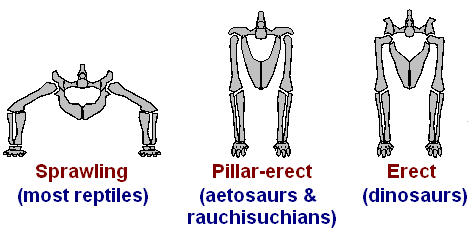 (It should be noted, a different type of erect posture, known as "Pillar-erect" seems to have independently evolved in other groups of Triassic reptiles - Aetosaurs and Rauisuchians).